NN-Dimethyltryptamine, or DMT for short, is a short-acting psychedelic entheogen that allows a person’s consciousness to encounter some of the most incredible experiences, visions, thoughts, and dimensions imaginable. DMT is, without doubt, one of the most powerful, yet mysterious, psychedelics in existence, but to classify it as merely a drug would be to do it a great injustice. DMT is more of a trans-dimensional key into experiences so profound and awe-inspiring that it raises many questions regarding the nature of reality and our place within it. NN-Dimethyltryptamine(DMT) is naturally occurring in every human being and is also prevalent throughout the plant and animal kingdoms. It has been found in many mammals, marine animals, trees, grasses, and flowers. DMT is closely related to serotonin, the naturally occurring neurotransmitter that psychedelics affect so widely. The pharmacology of DMT is similar to that of other well-known psychedelics. It affects receptor sites for serotonin in much the same way that LSD, psilocybin, and mescaline do. These serotonin receptors are widespread throughout the human body and can be found in blood vessels, muscle, glands, skin, and even in the gut. Depending on the dosage, the effects of DMT can range over a multitude of sensations; from bizarre, beautiful, and even ‘impossible’ visions, to literally jaw-dropping awe, as one is seemingly propelled into other dimensions of existence that human language and logic cannot even begin to describe or comprehend. Here one is observing a patterned field, basically two dimensional, although it may have a pulsating quality. One may remember having seen this before. This stage is characterized by the experience of being in an “objective” space, that is, a space of at least three dimensions in which objects or entities may be encountered. Sometimes the entities appear to be intelligent and communicative beings. This stage may be extremely energetic with an experience of everything happening incomprehensibly fast. Alternatively, it may be relatively coherent. Travel is possible at Level III. One may, for example, assume (other forms and/or consciousnesses and experience the physical or emotional content of these forms/consciousnesses). The limits of this stage, if any, are unknown. There may be transitions to further stages. If you would like to read some firsthand experiences of DMT journeys, you can browse the Quality Experience Report section of the DMT-Nexus. The feeling of doing DMT is as though one had been struck by noetic lightning. The ordinary world is almost instantaneously replaced, not only with a hallucination but a hallucination whose alien character is its utter alienness. 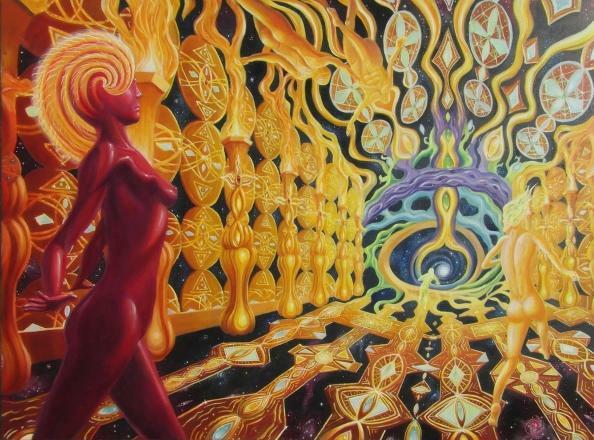 Nothing in this world can prepare one for the impressions that fill your mind when you enter the DMT sensorium. The extraordinary brevity of the experience argues that it is incredibly harmless. It virtually disappears from the organism in about ten minutes. The paradox is that DMT is the most powerful yet most harmless of all these things. This is probably because, for reasons which are mysterious to us, DMT occurs in normal brain metabolism [in Serotonin]. Even though DMT is one of the most intense psychedelics in existence, it is one of the safest, physically. Because the human body already contains DMT in trace amounts, the brain knows exactly how to utilize and metabolize this compound and it leaves the system in a matter of minutes. In fact, the brain actively transports DMT across the blood-brain barrier, an incredibly rare phenomenon that evidences the paradoxical nature of this endogenous compound that induces such otherworldly experiences. In fact, one could say that since DMT is endogenous to the human nervous system it is one of the safest psychedelics available, far safer than common alcohol and cigarettes. Mentally, DMT is extremely intense. One of the few dangers that one may encounter is a lack of preparedness for the intensity of the experience and may have trouble integrating it into their waking life. It may be helpful to have some grounding in esoteric or psychedelic states of mind before embarking on any DMT voyages. Set and Setting also play a big part in facilitating the most positive, insightful, and enjoyable experience possible. How Can One Acquire DMT? There are a number of ways to acquire this entheogen. The first and most difficult way is to have some substantial chemistry knowledge and experience and actually synthesize pure DMT in a laboratory. This is a rather tricky and time-consuming process and requires access to some rather obscure and hard to acquire chemicals. The most common and easiest method to acquire DMT is to extract it from the various plant species that contain the compound. The various plants and extraction techniques won’t be expounded upon here, but come on…you’re reading this on the Nexian, right? Maybe check out the DMT-Nexus forums and wiki. What Are The Implications Of DMT? The DMT experience remains one of the most baffling and amazing enigmas of the human experience. 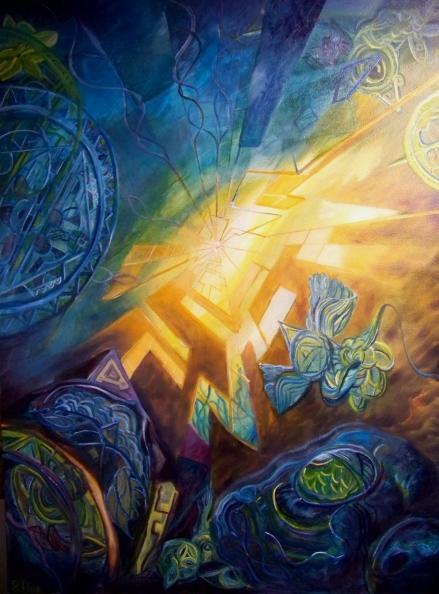 The realms one breaks into are frequently described as “amazing,” “incredible,” and even “impossible.” Many, if not most, who have taken DMT and experienced the phenomenon known as a “breakthrough” feel that their experience was not mere “hallucination,” ”hypnagogia,” or even material from their subconscious mind. “Although the amazing geometrical hallucinations experienced under the influence of DMT are sufficient in themselves to command attention among students of psychedelics, the really interesting part of the experience is the apparent contact with alien beings. Several questions can be distinguished. First, there is the question of the independent reality of the entities. Subjects report experiences of contact with communicative beings whose independent existence at the time seems self-evident. It is worth noting that at this point in time, we have no ability to verify claims about the independent reality of consensus reality, and should therefore not be too hasty to make such demands about the DMT experience. These experiences are not described as dream-like. If these entities have an existence independent of the DMT-influenced subject, then a realm of existence has been discovered which is quite other to consensus reality, which many assume is the only “real” plane of existence. The discovery of a “separate reality” would directly challenge the foundations of the current Materialist paradigm. Additional questions arise, regardless of whether the entities are independently-existing or not, as to what they are seen as and seen to be doing? What is happening, for example, when some subjects report seeing thousands of these entities simultaneously? Even more interesting is the phenomenon of communication, or attempted communication, which many people report. Some people also report seeing the entities communicating with each other, in some kind of mutual exchange — but what? This matter can also be approached from the point of view of neuropharmacology. What exactly is going on when DMT molecules are drawn across the blood-brain barrier and into the brain, causing it to function in what appears subjectively to be a radically different manner? Why does the brain seek out this molecule with an affinity normally reserved for glucose and other compounds understood to be vital to the functionality of the brain? Listed below are eight possible interpretations of the DMT experience which imply answers (true or false) to some or all of the questions raised above. Some of these, like the experience itself, are bizarre, but at this stage, any idea should be considered since in this matter the truth (to paraphrase J.B.S. Haldane) probably is not only stranger than we suppose, but stranger than we can suppose. 1) There are no entities at all; it’s merely subjective hallucination. The DMT state may be interesting, even extremely interesting, but really, there are no independently-existing entities to be found. Such a possibility might lead us to conclude that DMT is, at its minimum, neurochemical art; some of the most beautiful, interactive, awe-inspiring art available to the human mind. 3) DMT allows awareness of processes at a cellular or even atomic level. DMT smokers are tapping into the network of cells in the brain or even into communication among molecules themselves. It might even be an awareness of quantum mechanical processes at the atomic or subatomic level. 4) DMT is, perhaps, a neurotransmitter in reptilian brains and in the older, reptilian parts of mammalian brains. 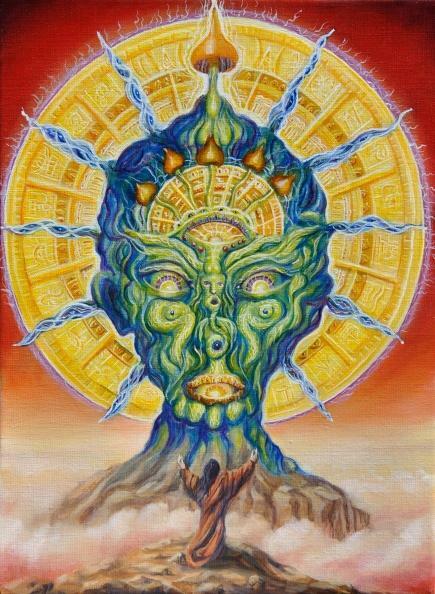 Flooding the human brain with DMT causes the older reptilian parts of the brain to dominate consciousness, resulting in a state of awareness which appears totally alien (and sometimes very frightening) to the everyday monkey mind. 5) A non-human intelligent species created humans by genetic modification of existing primate stock and then retreated, leaving behind biochemical methods for contacting them. The psychedelic tryptamines are chemical keys that activate certain programs in the human brain that were placed there intentionally by this alien species. 6) The realm to which DMT provides access is the world of the dead. The entities experienced are souls or personalities of the departed, which retain some kind of life and ability to communicate. The realm of dead souls, commonly accepted by cultures and societies that do not ascribe to a materialist worldview, is now accessible using DMT. 7) The entities experienced are beings from another time that have succeeded in mastering the art of time travel, not in a way which allows materialization, but in a way which allows them to communicate with conscious beings such as ourselves. 8) The entities are probes from an extraterrestrial or an extradimensional species, sent out to make contact with organisms such as ourselves who are able to manipulate their nervous systems in a way which allows communication to take place. These interpretations in no way reflect the entire myriad of possibilities surrounding the DMT experience but are intended to serve as a jumping off point for those interested in such thought experiments. These hypotheses can be expanded and are, of course, open to objections. It may be that one day we have sufficient evidence to pin down a certain hypothesis as a reasonable assumption as to “what’s really going on,” but today is not that day. It’s quite possible that such a day will never come. The important thing to remember is that, whether or not these experiences are “real,” or entities “exist,” these experiences are available to the human consciousness. The real question is not the objective validity of these experiences, but the subjective effects of these experiences. What can we learn from these experiences? What can we do with these experiences? How can we use these experiences to catalyze change in ourselves and the world around us?